The performer is seated at a small table in front of the audience, the manuscript and a glass of water sits on the table. There is a blue light-bulb on a microphone-stand, directed to the performers face as if it was a microphone. The performer is wearing a head microphone. The house light is on above the audiences, so that they can see each other. Say after me: To receive is to act. So, when I say “close your eyes” you close your eyes and you can’t see. And, when I say “open your eyes”, you open your eyes and you look…. I emailed a local priest, could I borrow the church…. here around the corner? And do a performance-lecture there, about a performance I’ve made called Choreography on the face? and why I wanted to perform in the church? The reason she didn’t understand was, she suggested, that maybe I didn’t understand? She is definitely onto something, I’m dealing with a subject I can’t grasp. But can she grasp her subject? I have looked in the notes in the logbook i kept, when I worked with Choreography on the Face. I’m sort of trying to learn the creation myth backwards here. I’ll jump a bit back and forth – if you don’t mind – between some considerations and some ideas for the performance. Some of the ideas went into the performance, some didn’t. Can you take something out of this world? It ́s a continuation of a series of one-to-one-performances I’ve been working on for 9 years. And that I’ve been calling Whole Body Treatment, as you can hear I am changing the title. It has been essentially about therapy – the Therapeutic Paradigm. And phenomenons bordering therapy, service and theatre fx. Therapy has a lot to do with borders it seems. One person I call audient climbed on the massage couch. The word audient is a mixture of audience and patient. The audient is a kind of centaur and has a double role as both stage and audience. A double role as both subject and object, observer and observed. The audient was blindfolded with a sleeping mask and I did the performance on their body. I’ll not be talking much of hands tonight, but we will be using our hands. Lift all of your hands. Wave your hands slowly from side to side. This semi-therapeutic relation has always been about exchange and transference – or you could say virtual in the actual – and there is no witnesses, so it’s a good place to observe. But I wanted to suspend the whole-body-thing. I wanted us to get so close, that we could get to some other place. I wanted a different form of one-ness this time. Two, who become more than two. Now I wanted us to be: One who become many. I wanted to find the ultimate place – to hide in. I closed my eyes and I searched over the body of a stranger with my hands, and I recognized the shape of the face. You know, some images must be seen with closed eyes. Look at the audience, open eyes and mouth wide up. That the face swings back and forth between words and images in eternity. Recognition means “know again, recall or recover the knowledge of, perceive an identity of something formerly known or felt”. Like therapy, recognition has to do with feelings and senses. And seeing something in someone – which one by the way? Tonight I want to talk about having a face in your care in a performance situation. The face is in fact a small area! Don’t we agree on that? Take two pieces of chewing gum from the pocket, and start chewing. As you’ve already learned, objects define their interaction with the outside world through the methods that they expose. Methods form the object’s interface with the outside world. Chew hard on the chewing gum. So, I’ve searched for a note in my logbook, that forms a starting point – it ́s like reading a teenage diary. Read with a dramatic whispering voice. The face as a metaphysical reference that takes EVERYTHING! I decided to quit the sleeping mask and the massage couch. In order to be in a bare room. Tonight, we will be doing some choreographies two and two or one-to-one. Now, find one another sitting beside you. Check that everyone has found a partner. Has everyone found one another? You will need each other for the choreographies. As you are sitting there, beside each other: What is choreography? Choreography is the practice of designing sequences of movements. “Choreography on the Face”. Why ON? – Why not OFF? On, like a red di-ode. On like in presence – which – according to the bible, simply means FACE. So, There is a long text or choreography about the face already. And when you talk about FACE, you HAVE to mention GOD. GOD – is such a long long word, so, I will instead say G. If thats OK with you?! The GENRE is blurring or blushing. How would a priest start? “In the beginning was emptiness“. I was empty for a year and 25 days before I started putting notes in my logbook. It is called depression – and depression is holy in that it is not moving. It’s an absolutism, but you are not aware of it while it is happening. Eating is cultic, it ́s moving around inside, then down, a little up, then down, down. I wanted to create a cultic atmosphere. And in fact, inaccessibility is a key quality of a cult image. I was very moved by the English language when I worked with this performance. An expression like “bitchy resting face” hit me, “canonical picture” blew me away. Can you still hear the words? Back in 2009 when I started to work with one-to-one performances phenomenology was still around, and I used a lot of objects, a complete set of organs, in one version a table cloth, cutlery and a portion of spaghetti with tomato sauce that I would devour on the audients body, an apple etc. And I was trying to find out back then: do the phenomenons find us or do we reach out after them? 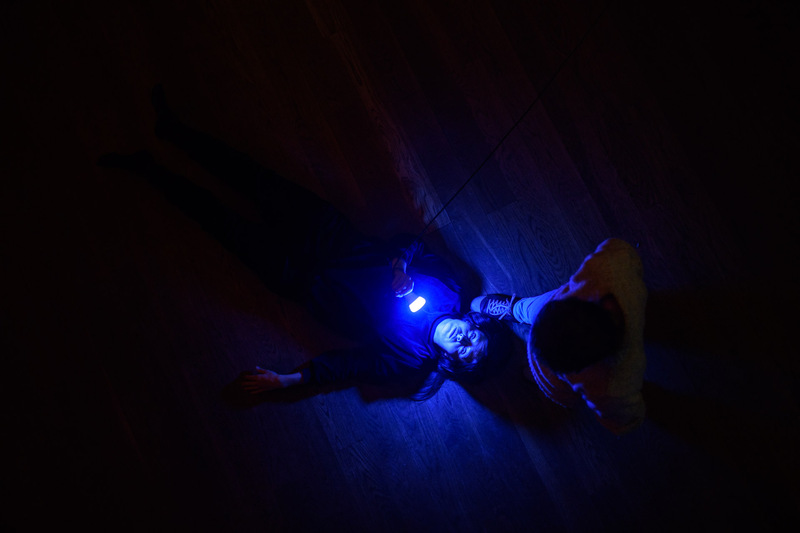 In this performance I wanted to create an “emotional object” that I would roll over the face of the audient in order to choreograph the interface between us. It had to be very light, something I could carry in my pocket. Can I – in collaboration with the audient – charge an object with a strong emotional energy? What should the object be? How could I produce this object? By repetitions, comparisons or by extractions? Could the object be a tense jaw-muscle? A bitter taste bud? No. I could only REALLY think of a mouth – a soft silicone model of my mouth. Not in a one-to-one scale, but one to 55. I thought of cutting it in wood instead, so I could hit my mouth against the floor and say “clack”. It would be an effigy: Which is a representation of a person in the form of a sculpture or some other three-dimensional medium. And I could take it of again. I couldn’t think of ANY object as THE object. The feminist scholar Sara Ahmed, who provided me with the “to receive is to act”- sentence, did, as part of a discussion of happy objects write: “explore how happiness functions as a promise that directs us toward certain objects which then circulate as social goods”1. I could ONLY think of the FACE as an object. I COULDN`T think of the face as an object. I could ONLY think of the face as THE object. Which ONE am I really talking about and is it a problem that I don’t know? I was trying to figure out, how I could do a safety-contract with the audient at an early stage in order to get access to the face and work there. Like Humanity is at work there. Some kind of physical submission maybe, where I simulate equality. I was familiar with the body-scene, but this was different. I thought about pleasure as a solution. I talked to friend who is a coach, she strongly advised me to do just a plain facial massage. Why not do something very physical, something not as much a science, as a way of being. Something really GOOD! She said. Can you read a face in the same way as you read a text? And the other way round? What is the “eternal text about the face that I can’t edit” that I had been writing about in the project-application to The Arts Council? Is misspellings a relevant hiding-principle or is letters choreographed as well? Are they dancing? Can you change the world without witnesses? I had an idea: We are doing our own thing – me and the audient – beside each other for two hours or more. And every 15 minutes – we do have a timer – we look at each other and we ask: Is this mine or yours? And then we continue. I had another idea, to use the audience as a mirror when I put lipstick on. Take a sheet of Kleenex from the pocket. Shake it so that it folds out. Spit out the chewing gum in the Kleenex. Look down at the chewing gum. I’m not so sure I like chewing gum. Look up at the audience. But I think I like you. Put the Kleenex in the pocket. Look at the audience. There is a completeness to the design of the face don’t you think? It emits; This is everything! Especially when the hairdo is nice. So where do you imagine the rest? Say in a deep voice. “Your face is a little mosquito that I tried to catch for 50 minutes”. In the course of the research I found out, opposed to what I thought in the beginning, that there is just one reality. Now, Look at the colors on the face of one another. Look at the colors one by one. It might be difficult at first, but as you get used to it, you can do it. Let the colors float – one by one – on the seas of your eyes. English, IS a really beautiful language! Now, look at me. How do you feel? Sara Hamming performance artist/writer, based in Copenhagen.